Saturn is well-know by its rings and it cannot be denied that they are a feature that makes of this planet an intriguing world. 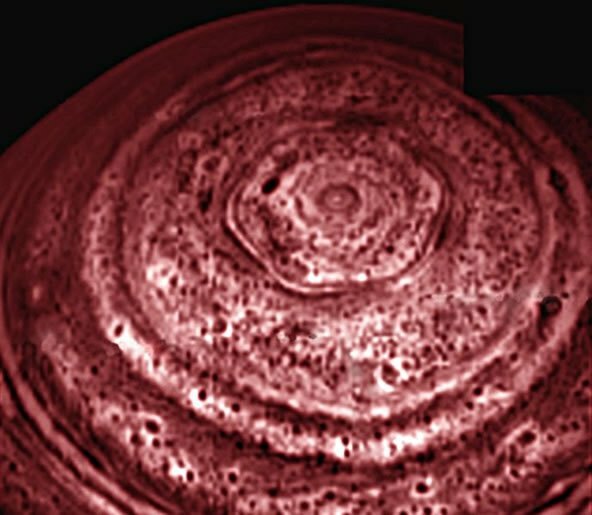 However, in the 1980s NASA’s Voyager 1 and 2 observed a bizarre, but symmetrically interesting feature in the north pole of Saturn: a hexagonal shaped storm. More recently, NASA’s Cassini has been able to image Saturn hexagon in greater detail. The hexagon is 25,000 km (15,000 miles) across. In fact, you could nearly fit four Earth-sized planets there. The hexagon appears to have remained fixed with Saturn’s rotation rate and axis since first glimpsed by Voyager. The actual reason for the pattern in the storm is still a matter of speculation. Kevin Baines, atmospheric expert and member of Cassini’s visual and infrared mapping spectrometer team at NASA’s Jet Propulsion Laboratory is quoted saying: “Once we understand its dynamical nature, this long-lived, deep-seated polar hexagon may give us a clue to the true rotation rate of the deep atmosphere and perhaps the interior. The most secret of messages… cracked! !